Sign up for Broadjam today to follow Poloneius Pluck , and be notified when they upload new stuff or update their news! A mixtape style cd.....lots of freestyles, studio out takes, radio freestyles, and other unreleased material . 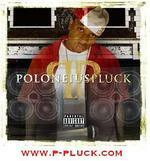 Poloneius Pluck undeniably stands apart from other artists not only due to his unique voice and star-quality stage presence, but also because of his quick, steady, and consistent rise in the industry. In the last year alone he has opened for Fat Joe, Trillville, David Banner, T.I., as well as, Lloyd Banks & Young Buck of the G-Unit. He has already released his first self-titled LP (visit www.p-pluck.com) and, in addition to critical acclaim, is receiving steady sales to back the hype. Publisher Credits The No Name DJ, Inc.